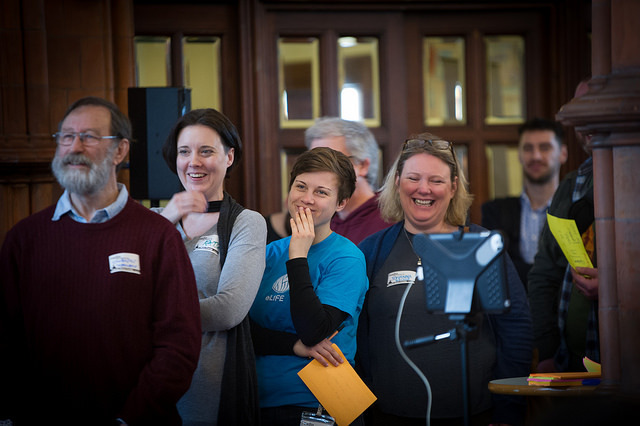 This is the second in a series of posts about the WinchBiz unconference, which takes place on Friday 2nd March 2018. In case you missed it, the first post was Introducing WinchBiz. 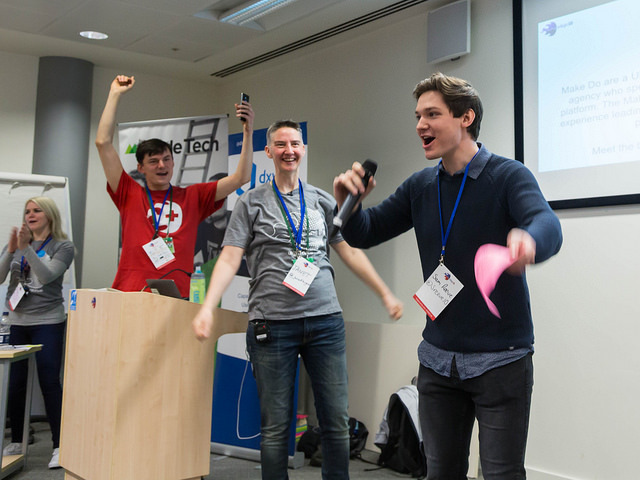 This post is intended for attendees, and provides a ‘quick gist’ of what to expect on the day. 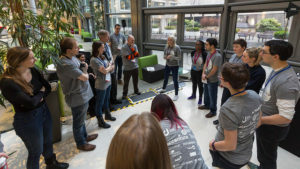 Because this is our first WinchBiz event, we’re using a selection of photos from other unconferences to give you an idea of what’s involved. Go to Bapsy Hall (our ‘big room’) on the first floor. There will be fresh tea, coffee and pastries waiting for you when you arrive. Spend no more than 30 seconds telling people your idea. There’s no single right way to pitch a session, but you need to try and convey your idea to the wider group so they know what you want to discuss. Thirty seconds can seem like both a very long – and a very short – amount of time, so it’s a good idea to plan what you want to say beforehand. 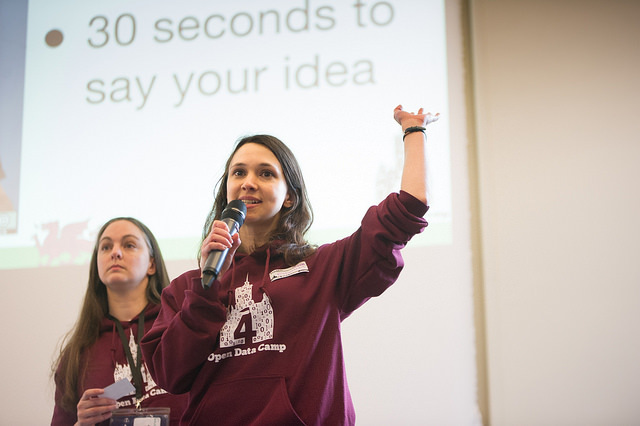 If you want to see some pitching in action, here are some of the pitches from the UKGovCamp unconference in January 2018, which is broadly about innovation in UK public services. Apologies for the shaky video, which was impromptu and filmed on a mobile ‘phone. Not everyone is an extrovert, and there’s no need to worry if you aren’t comfortable pitching to a group of people – we will provide other ways to suggest topics. 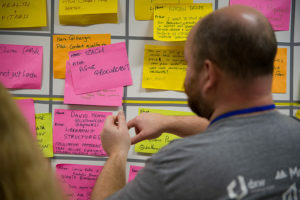 When you have completed your pitch, head over to the session grid, and hand your post-it to one of the volunteers. Stay near to the grid in case they need to ask you anything. 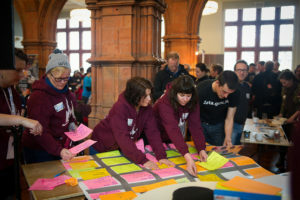 Volunteers begin creating the agenda whilst session pitching is underway, putting the post it notes into vacant slots on the session grid. They will carry on doing this while you go and top up your cuppa, or just chat with others. We will let you know as soon as the session grid has been finalised. Now, it’s over to you to decide which sessions to go to. There will be a separate post telling you a bit more about what to expect at the sessions. The event is filling up fast, but it’s not too late to register. We’d also welcome additional sponsors. If you are interested in sponsoring, take a look at our Info for Sponsors. We are also seeking volunteers to help make everything run smoothly on the day. There will be a separate post about that, but in the meantime if you think you might be interested in helping out, please get in touch. Just in case you haven’t already heard of VentureFest, there’s another event for businesses, and it’s the day before WinchBiz at the same venue. Head on over to the Venturefest South website for details. 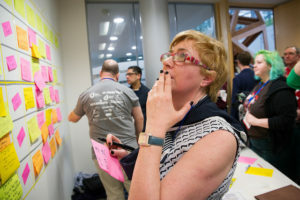 That’s it for now – there will be more posts to follow, including some more information about sessions. Are these just random ideas or are they ideas that are meant to adress a particular issue or problem? Hi Sally. That’s a good question. 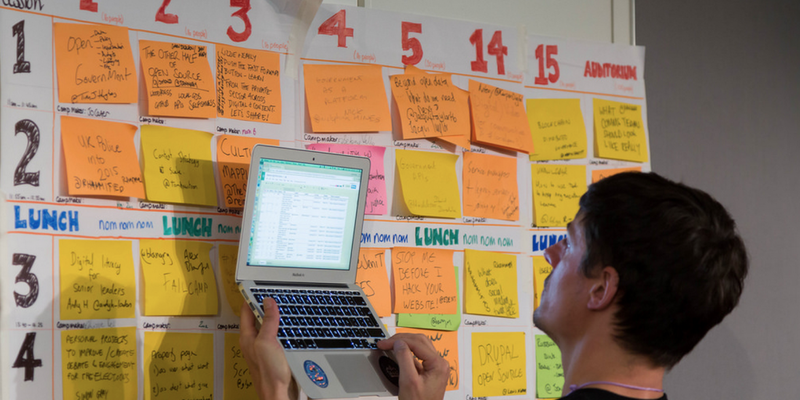 There’s no pre-defined agenda, so it really depends on what people decide to pitch on the day. I suspect it’ll be a mixture of both, with some wanting to find solutions to specific issues, and others floating ideas or opportunities. As long as pitches are associated with Winchester and business, there’s a great deal of flexibility, and both can be accommodated.